This is one of the reasons I got a longarm! Actually, many long arm quilters do offer a sandwiching service. They use a really long basting stitch. My machine came with one built in specifically for this purpose. I use my cutting table to sandwich my quilts. I start in the center, clamp everything down, 1 layer at a time and then either pin or thread baste that whole section. 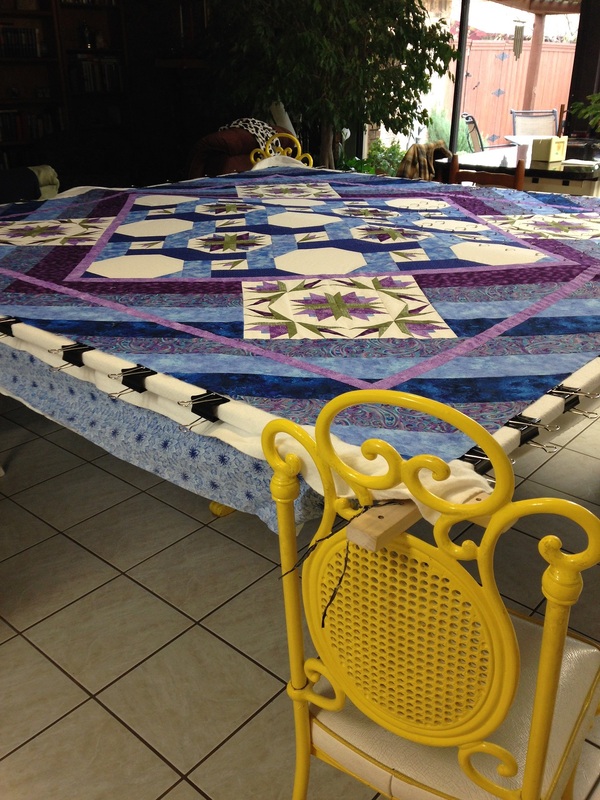 Move the quilt all over the table until the entire quilt in sandwiched. It's tedious moving it around bit by bit but it certainly beats crawling around on the floor! I've done everything from baby to king quilts with this method. My cutting table is the type sold by JAF with the drop leaves on the sides and about a 12" center section. I have a large island in my kitchen (5 feet x 5 feet) and I use that! I use the JAF cutting table also...somewhere I read to tape a quarter in the very center of the table...that way you can easily find your center for your backing and top by feeling for the quarter. That eliminates pretty much any guess-work in using the table. Since I spray-baste, I do this process outside and the table stays outside under an eave in a fairly protected area and comes in handy for other things but it does live out-side.. I know its not meant for that but seems to work out ok. Many years ago, I made use of our kids' trampoline!! that was pretty great..but still awkward. Large table tops work best..larger the better. I use the long tables put together in our apartment's lounge. before moving here, i've used the tables at the library. I also use the JAF table with the drop leaves, however, my problem is opposite of too big a quilt. I do lots of throws and wall hangings which aren't as big as the table. I can only clamp 2 sides, then have to tape the other two, and always end up with a wrinkled backing. Any suggestions as to big table/small quilt? My handy DH made my basting frame which sits on top of my kitchen table chairs. It's 8ft x 8ft and breaks down into 5 8ft 1"x2" boards which I store in a corner of my sewing room. The sewing room is to small to baste in so I do that in the kitchen. The 5 boards are held together with wing nuts and it is at a good height for comfort. I can pin the entire quilt except for about 12" square right in the middle. 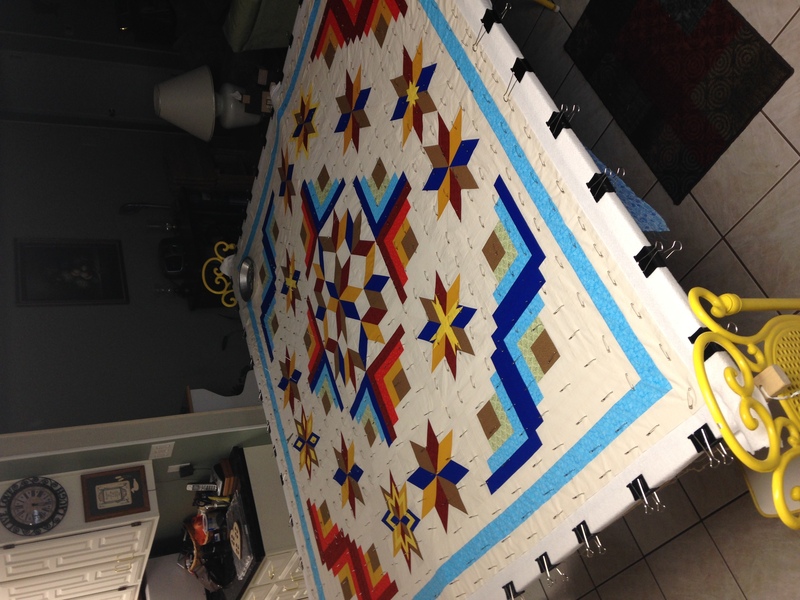 That last 12" I baste after I have released one side of the quilt then I stand inside the frame area to reach. Jim got me two plastic tables a while back. They are each 30 inches by about 5 feet. They fold in half when I am not using them and they can go behind the couch. Last edited by Boston1954; 05-14-2018 at 06:14 AM. I have used the floor, tried the wall method, used the pool table and done the ironing board method. Last quilt I did was on the floor but my knees and back revolt too. Our basement is being renovated after a flood and when all is finished, I plan to buy one, or possibly two, of those long folding tables. I make smaller lap quilts for chemo patients, use spray basting, so I am hoping the tables will be the solution for me. My cutting table is 4ftx6ft and I spray baste on top of it. I have another 2ftx6ft table that I can add on if I need it bigger. A big saver for backs is to have your table on bed risers (whether for cutting or spray basting). Oodles more of noodle links to check out if you ask Mr. Google. I glue baste with Elmer's washable school glue (replaces pin basting, not spray basting, doesn't have to cover the entire surface) on my dining room table. No clamps involved. Smooth out top wrong side up. Position cotton batting and then position backing right side up. Smooth. can work from center and out, or from one end down and then the other end. It is the easiest thing and I am about 15 quilts in and nary a ripple or sore anything. No fumes. No overspray. I drizzle it on in a sort of grid or a meander about where a pin would go. If it globs, I use my finger to smooth it out. It has always washed out of my quilts. Do one side, and flip over and do other side. Next morning it is dry and ready to quilt. Oh, wish I could find a site I was on yesterday. She used pool noodles with dowels or pvc pipe inside the noodles. Maybe you can search pool noodles quilt basting. But even if I didn't, I think I'd still make time to use them there. This will be perfect as I just don’t have space for 2 tables in the upstairs loft...my Simply Sixteen with the 5 foot Little Frame is in the loft by the front windows. Thank-you!!! That is how I baste a quilt. It doesn't take very long and it uses up odds and ends of thread and bobbins too. Nanny's dollface, here is the link to the frame with instructions. Hope it works as well for you as it does for me. We got me a long folding table for our deck & I do a big quilt by folding each part of the sandwich in half the long way & spray basting it. Something helpful is rolling each part on a pool noodle & roll it & smooth as you unroll it. They have bed lifters that will pick the table up for an easier height too! Let the sandwich dry for a couple of days or at least over night & start quilting! :-) I can't get on my knees any more, so this is my saving grace! If you use one of those white plastic tables (Walmart, etc), you can raise the it to the proper height with pvc pipe. Cut to length that works for you and insert each table leg into the pipe. Lowe's has precut pieces with a "finished" edge that are, I think 12" long. I forget what they are called, but are in the plumbing dept; good if you're going to use them on a finished floor. I iron it dry. First one side then the other so there is no waiting and yes it still washes out with no residue.